No Point in Not Being Friends will carry on in Manchester, we promise. we're busy doing other things over the summer. we've got a slot at the Camp Bestival festival at the end of July: more info about that soon. 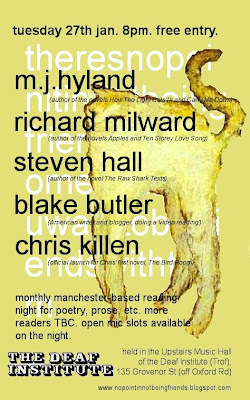 we're doing a special version in October at Matt and Phred's in Manchester, as part of the literary festival: again, more info soon. and from September onwards, we'll do some kind of monthly thing somewhere again, promise. it might be a bit smaller. maybe just two or three confirmed slots per night. there will still be open mic and things, too. thought it was about time we wrote on here to explain our absence... Don't be alarmed by the seeming lack of activity; like a mass of tadpoles wriggling around in the murky depths of an apparently stagnant pond, there's plenty going on beneath the surface. To explain - after nine amazing reading nights, we're having a little break. In part, to concentrate on planning a couple of big summer/autumn events we've got coming up (Camp Bestival and the Manchester Literature Festival) but also, because No Point is going to have a bit of a format change when it emerges from its spring cocoon, we think. It may not be monthly anymore, and it might not even be in the same place, but it will definitely 'be', one way or another. And we hope, it will 'be' better than ever. Thank you for being patient. In the meantime, you can still email us at nopointinnotbeingfriends at gmail dot com if you want to know anything, or tell us anything, or send us jokes etc. that would be nice. the next 'no point' night is on Tuesday, March 24th. we thought we had an extra week, and had told people 'the last Tuesday of the month'. sorry about that. it's not. it's NEXT TUESDAY. plus the usual open mic stuff, etc. more TBC. please come. it's at the Deaf Institute on Grovesnor St, just off Oxford Rd, and it starts at 8pm-ish in the upstairs room. Jenn is going on first, i think, as there's going to be a bookstall and things too. 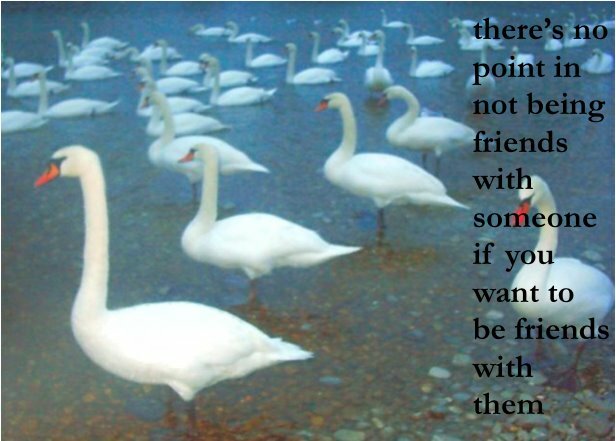 there's no point in not being friends with someone if you want to be friends with them: the perfect antidote to gloomy, depressing February. The next night is booked for Monday 23rd. After this, it will return to its regular slot on the last Tuesday of the month. This month we've got a special guest curator, Sian Cummins, giving Chris the chance to relax and enjoy the readings without having to dart about with a dog-eared, biroed running order, marshalling wayward readers. That'll just be me and Sian. We've got some brilliant readers, including No Point favourites Tom Fletcher, Luke Yates and N.P. Murgatroyd, a video reading from Catherine Lacey, live drama, and music from the excellent Si Connor. As always, there'll be open mic slots, too. 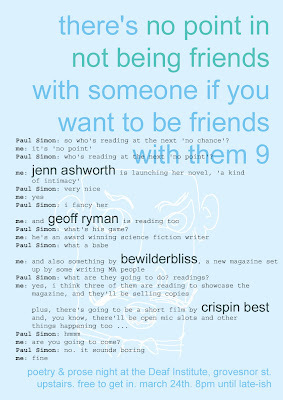 Please email nopointinnotbeingfriends at gmail dot com if you'd like to put your name down, or bring something on the night and find me or Sian. There'll be lots of drink on sale and lots of time between readings to buy / drink it. It's upstairs at the Deaf Institute off Oxford Road. Doors are at 8pm, and it's free to get in. the next night is booked for Jan 27th, at 8pm. it is also going to be the official 'launch party' or whatever for The Bird Room by Chris Killen. 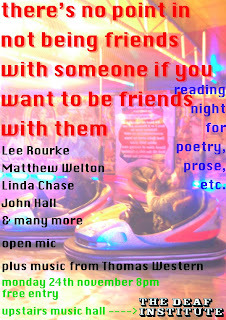 if you're still in Manchester over Christmas, please come to the next No Point In Not Being Friends night -- it's booked for the 23rd of December, and starts at 8pm. we have lots of good stuff booked: Nicholas Royle, Socrates Adams-Florou (reading from his new chapbook 'Flesh Feast: The Human Brain'), Ben (and possibly Matthew) Davis, Emily McPhillips, and lots of other people will be reading. there's also open mic slots. the video reading this time will be by the American writer Chelsea Martin. there's also going to be Christmas food and drink offers (see poster) and some other things; a 'surprise present', christmas cover songs, etc.